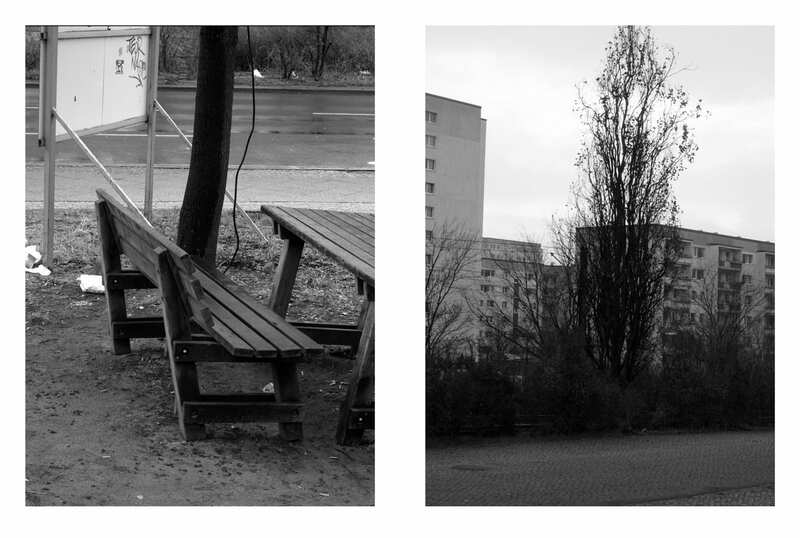 In 1996, eight years after the fall of the Berlin Wall, literary critic Andreas Huyssen described Berlin as a ‘city of voids … ‘a historical text, marked as much, if not more, by absences as by the visible presence of its past’. The city that Huyssen wrote about no longer exists. 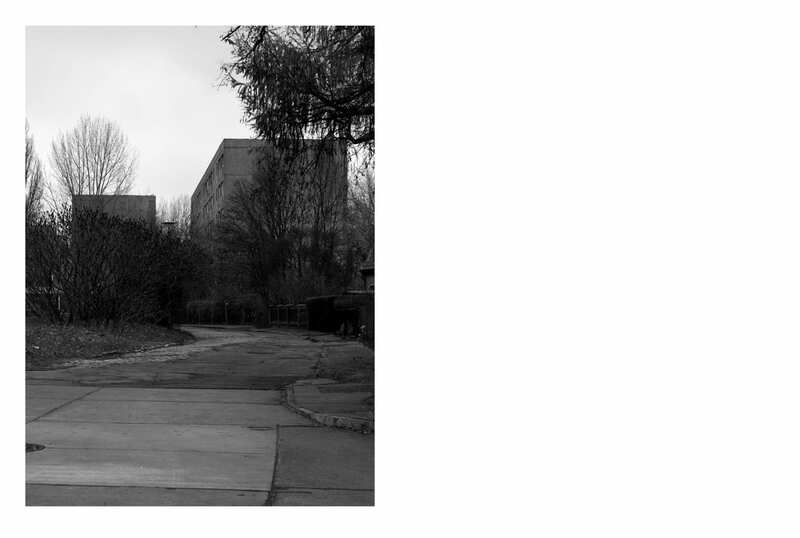 The voids that pierced the heart of Berlin have mostly vanished, built over or repurposed in the service of capital accumulation and mass-market cultural memory. A walk around the city center reveals exactly the sort of urban landscape-as-image whose emergence Huyssen lamented – shops and public spaces, business and commercial developments. 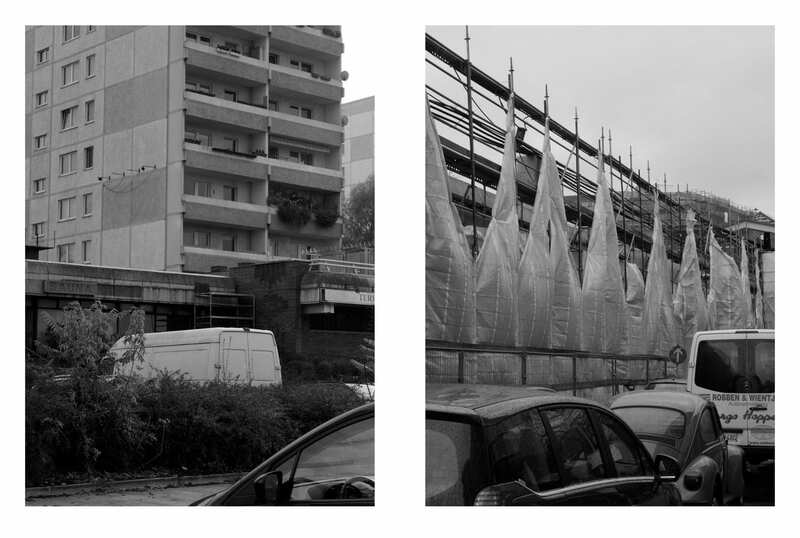 Michael Ashkin’s Horizont explores a different kind of urban void – the ‘breaks, fragments, incoherencies, and contradictions’ in districts beyond the city center, where large-scale redevelopment has yet to take hold. 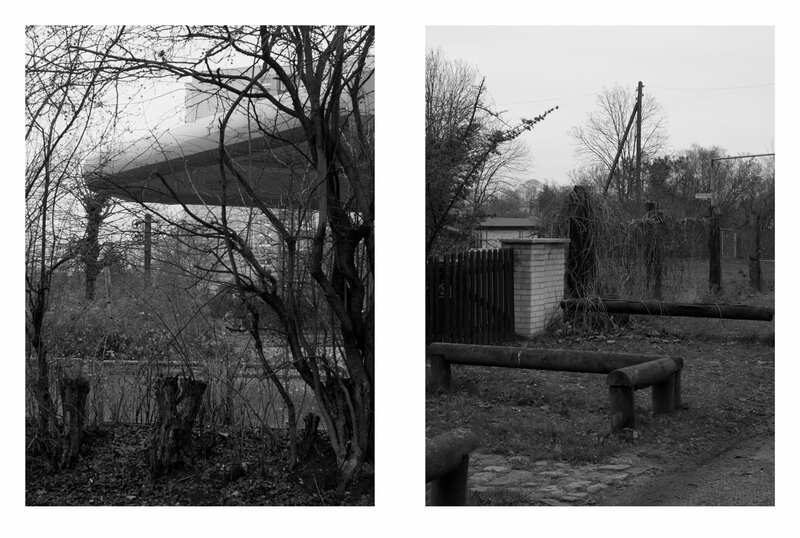 The postwar architecture in areas like Marzahn, on the city’s eastern fringe, was thrown up quickly and without ceremony, in answer to a need for basic amenities. 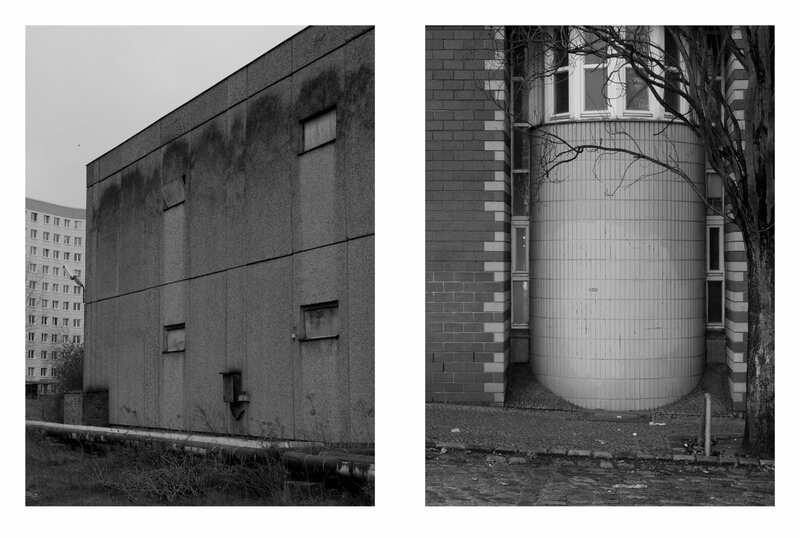 Functionalist construction of this sort may once have embodied modernist aspirations, but it persists into the present as a kind of zombie architecture, much of it abandoned, physically present but devoid of anima or soul. 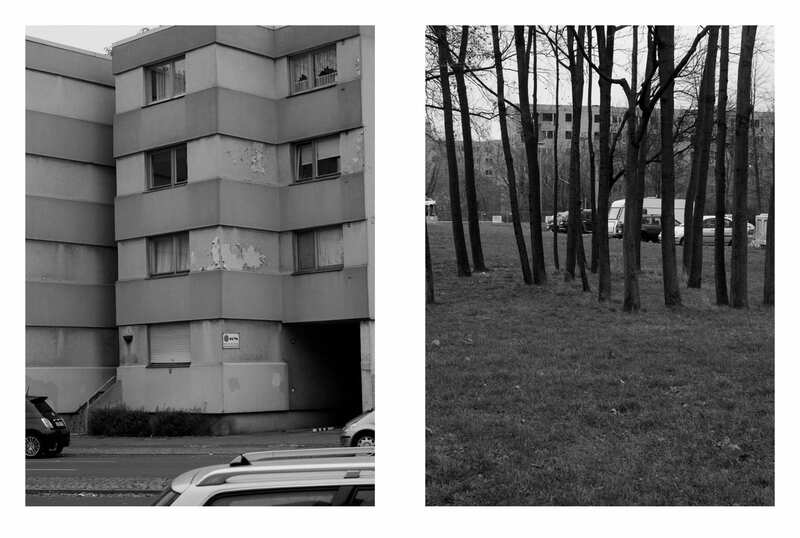 The architecture of the suburbs belongs neither to the historical image of pre-war Berlin, nor to its new identity as a contemporary global city. There’s a kind of deadpan anarchy about places like these, patchworked together out of remnants and interstices that capitalist development can’t easily assimilate. 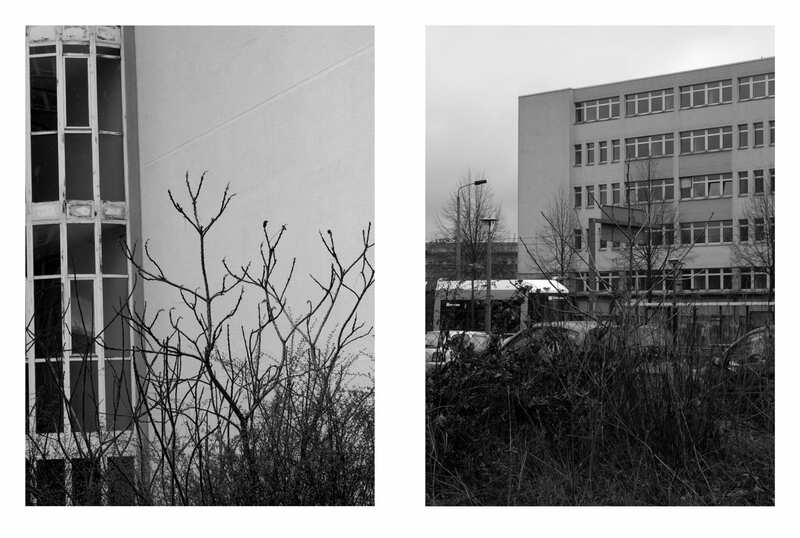 This sort of space doesn’t respond readily to the camera’s propensity for order, and Ashkin’s photographs play on its strange, disorienting quality, looking up past the tops of buildings, peering out from behind knots of vegetation, gazing dully at the ground. Many of the photographs feel like accidents. The modern city engenders various pathologies, among them agoraphobia and claustrophobia – the one an intense anxiety felt in open spaces, the other, a panic brought about by confinement. Horizont channels both of these aberrations. In Berlin’s remade center, the conjoined logics of built space and photographic space operate in concert to create an image of the city as a traditional European metropolis and a high-tech global hub. 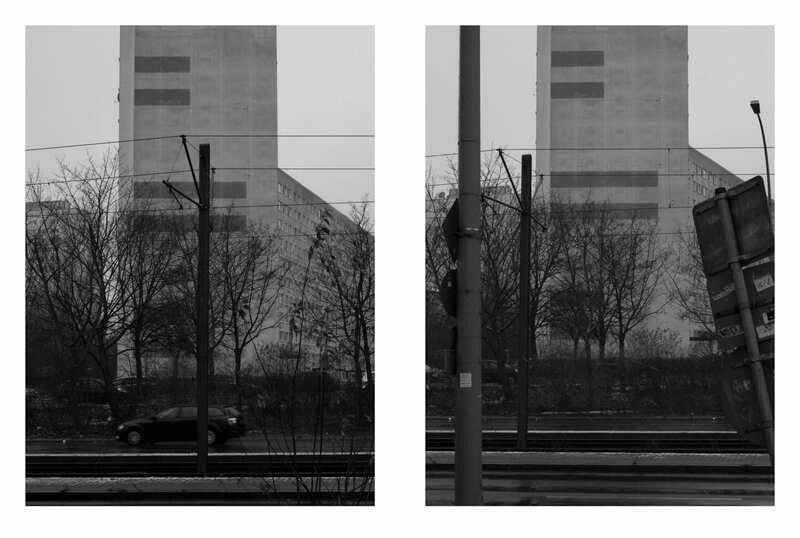 The edges of Berlin have yet to be colonized by capital or by the gaze of the apparatus. Why here? Why this place, this view? 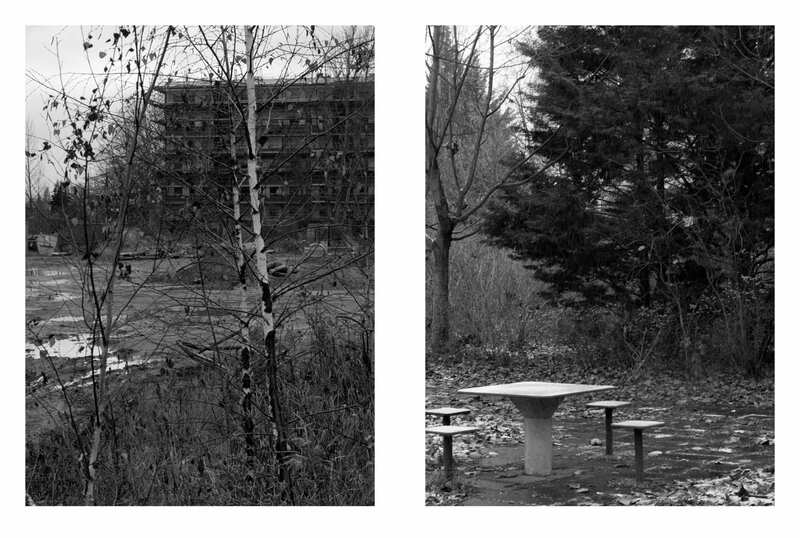 There’s no map, no pattern, no obvious narrative behind Ashkin’s photographs – just an accumulation of decentred places, encountered tangentially, glimpsed out of the corner of the eye. 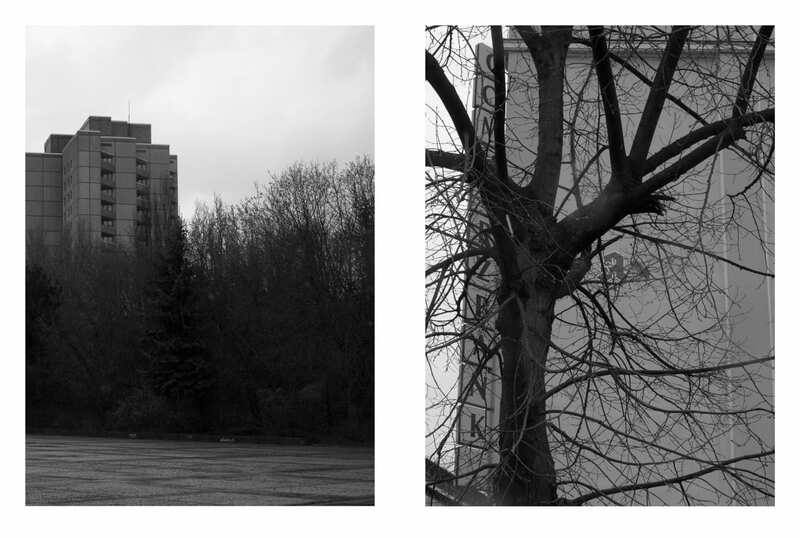 Travelling by train to the outskirts of the city, Ashkin walked back to the center, guided by his instincts, never sure exactly where he was or what he was looking at, passing through neighbourhoods where the trauma of Berlin’s past has been renamed and bulldozed and built over, cloaked in anonymity. 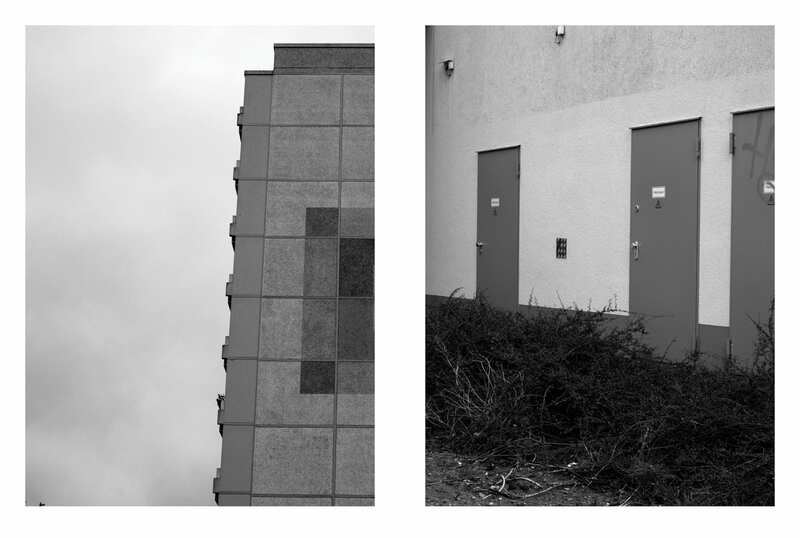 The photographs in Horizont – vertical crops extracted from horizontal negatives – intensify this anonymity. 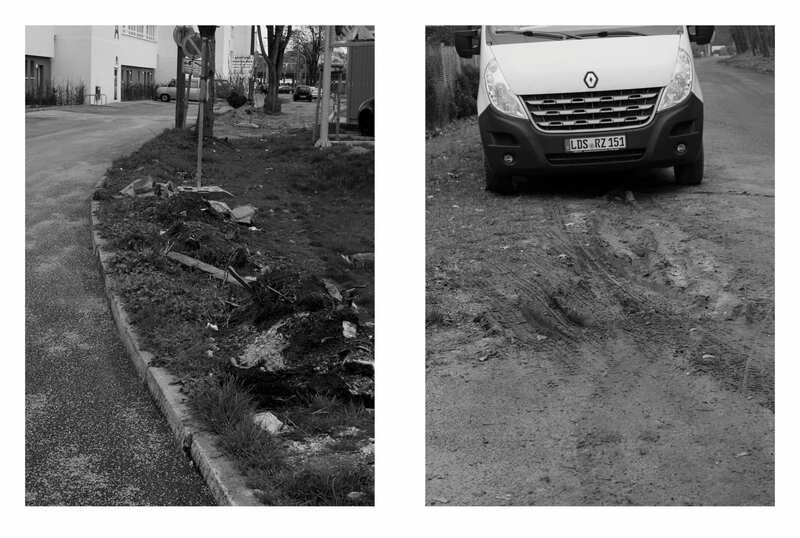 They have the blunt impartiality of images created by an unreasoning agent – a photographer not fully in control of the camera, or a subject imperfectly incorporated into the space of the city. The camera wasn’t meant to work this way, producing images that push back against its discipline, against our habits of seeing. ‘Space begins because we look away from where we are’, wrote philosopher and critic Gus Blaisdell. 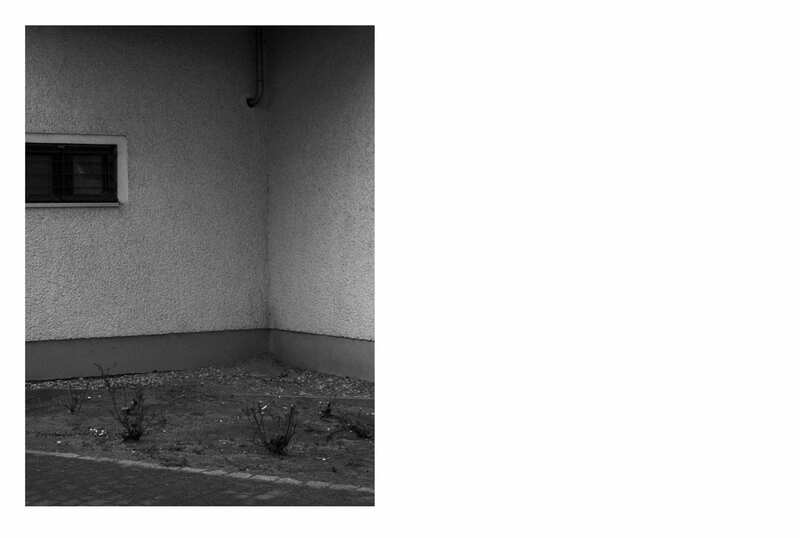 The camera’s perspectival schema empowers this vectorial gaze – a gaze that brings spatial order to time itself, moving away from the here and now, quickening towards the horizon. 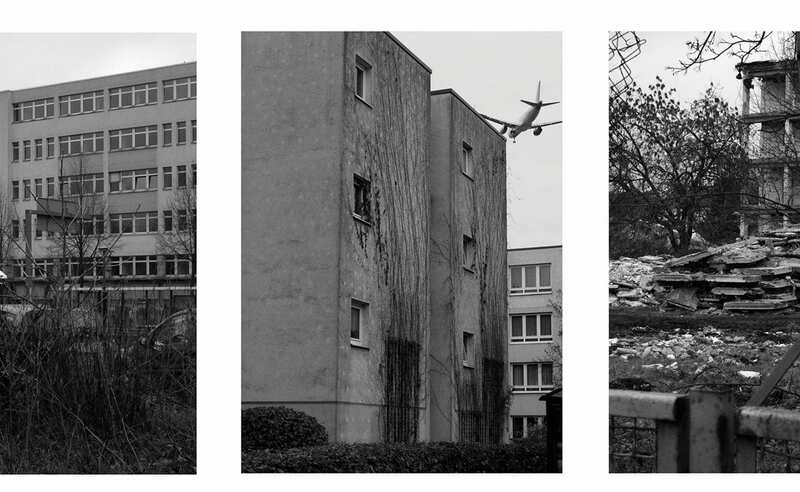 The transformation of Berlin’s center into an image makes its past visible as something distinct from the present, something easily consumable, its voids filled, its absences papered over. Horizont treats space and time in a different way. What’s at stake here is not just the subject of the image, but the camera’s subject; not what the photographer is looking at, but the points from which he looks. 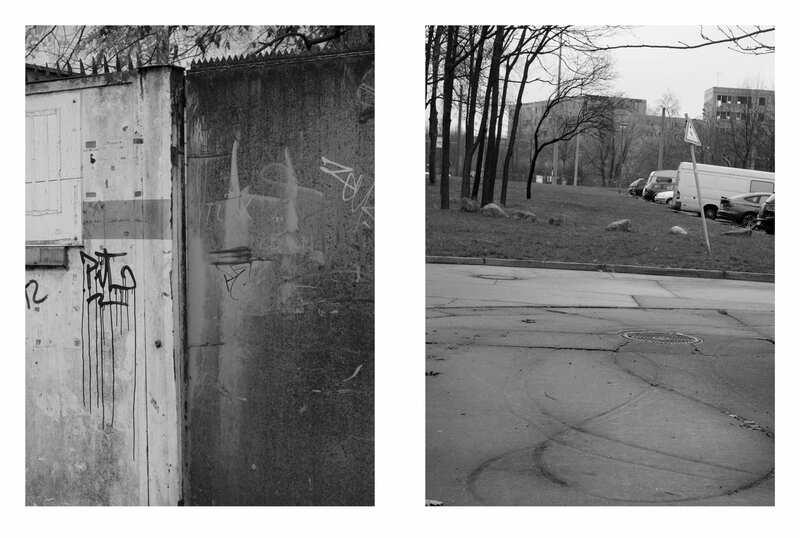 Scattered and plural, these points are the product of encounters with places that can’t be ordered in or by the photograph, where the past persists in the form of fragments and traces – ‘ghosts which no amount of development can really hide’, as Ashkin describes them. Horizont makes these ghosts and absences perceptible, blurring the lines of force that give shape to space and time to history. 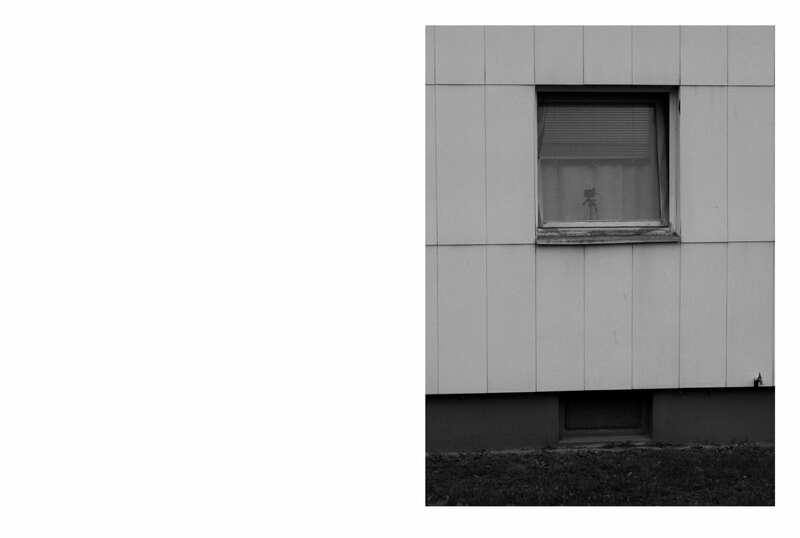 Posted in Feature, Reviews and tagged Andreas Huyssen, Architecture, Berlin, Eugenie Shinkle, Gus Blaisdell, Memory, Michael Ashkin, perspective, photographic space, TIS books, Trauma.